A solution for Jerusalem needs to be negotiated – Bishop Munib Younan (left) and Elan Erzacht are in agreement on this. But they each have a different emphasis. The Palestinian Bishop Munib Younan and the Israeli author Elan Ezrachi both grew up in Jerusalem. 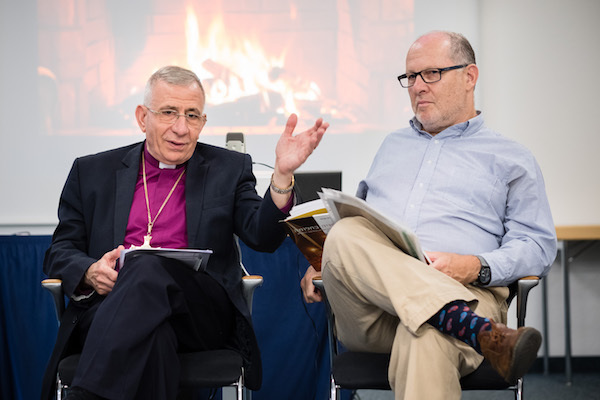 During a ‘fireside chat’ in Bonn they reported on their life in the divided city, on the unification in 1967 and their hopes for the future. The Palestinian Bishop Munib Younan and the Israeli author Elan Ezrachi were united in their view that the time is ripe for a solution in Jerusalem. But they each laid a different emphasis on a future for the city, which before the Six Days War of 1967 had been divided between Israel and Jordan, but since then had come totally under Israeli control. Ezrachi, who was a former helicopter pilot in the Israeli army and now acts as an adviser to Israeli organisations and companies, expressed his impatience: “We should not wait for the politicians” he said and reported that “there are already networks between neighbourhoods, schools, museums and sports clubs, in which Jews and Arabs are working together and taking their fate into their own hands. We don’t have time to wait for the politicians.” He has recently published a book about his home city: “Awakened Dream: 50 years of the complex unification of Jerusalem”. Younan and Ezrachi both grew up in Jerusalem, which had been divided between Israel and Jordan in 1949 following the Palestinian War between Israel and its neighbouring Arab states. Those present in the audience were enthralled to follow the stories of the two men as they sat in front of the image of an open fireplace projected onto the wall behind them, and talked about their lives in the two parts of the city, hermetically sealed off from one another – and their experience of its unification in the 1967 Six-Day War. Ezrachi acknowledged with appreciation the prudence of Israel in opening up for believers the possibility to go to the holy places of the three religions, which had formally been in the closed off Jordanian Eastern part of the city. “After unification East Jerusalem became a place in which each religion could practice its faith.” But in retrospect he, too, sees history as ambivalent: “Jerusalem was unified under the rule of Israel in pursuit of its own interests”. The situation now was that all of them, occupiers and occupied alike, were imprisoned in the same city. Hostility and racism continue to prevail. But there is a growing number of people who are concerned about finding a resolution to their questions.